Active learning and emerging technologies are enhancing student learning though an explicit intentional educational design such as Flipping the Classroom and Project Based Learning to empower students. 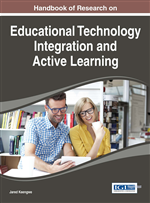 In this chapter, the authors describe an active learning classroom and emerging technologies that support learning for the 21st century. Using vignettes, the authors model how the metacognitive teacher supports the use of emerging technologies for active learning using the Metacognitive Technological Pedagogical Content Knowledge Framework (M-TPACK) (Wilson, Zygouris-Coe, Cardullo, & Fong, 2013). Finally, the authors describe Blooms Taxonomy (Bloom et al., 1956) for active learning and make connections to emerging technologies and the level of integration using the SAMR Model: Substitution, Augmentation, Modification, and Redefinition (Puentedura, 2006). Skills for Living in the World: Citizenship, life and career, and personal and social responsibility. The ATC21S has also identified two skills that span across all of the aforementioned categories: collaborative problem-solving and Information Communication Technologies (ICT)—learning in digital networks. As a nation, we must develop students’ 21st century skills to ensure that they will have a place in a global competitive economy. Emerging Technology: Tools, concepts and advancements utilized in diverse educational settings to serve a variety of education related purposes. App Smashing: Content created in one App, then transferred, and enhanced by a second App and sometimes a third, or fourth App and the final product is published for public consumption. Second Screen: Any mobile device (e.g., tablet, smart phone, laptop) with wireless connectivity that can be used by the learner in addition to using other media devices. Flipped Classroom: A pedagogical model in which lecture and homework are reversed this model. Project-Based Learning: An instructional model used to develop students’ deep knowledge of subject matter through actively engaging students in exploring real-world problems and issues. Active Learning: Any instructional method that engages students in the learning process.